Important Notice: I am looking for someone to help maintain this addon. It's a great addon, I just don't have the time any longer. Tired of manually having to open your macro window to swap macros for bosses? Running out of macro space because of all the different boss macros taking up a slot each? Getting sick of having to dig through your bags every time for those special daily quest items? Then IHML might be what you want. IHML is an addon that gives you one macro which automagically changes what it is depending on what zone you're in or which BigWigs boss module is enabled. All you have to do is take the IHML macro (the addon creates this for you and you can find it in your macro window or by typing /ihml pickup) and place it on one of your action bars. It comes preloaded with various macros for most if not all daily quests found in the game, and also provides marcros to help with boss encounters. You can also add your own macros using the options menu (found by typing /ihml). IHML will only use one macro slot and will work with any action bar addon that you can put a normal macro on. Due to addon limitations macros can't be swapped in combat but will instead be queued for swap as soon as possible. Change de macro selon la zone où vous vous trouvez ou selon les modules de boss BigWigs activés. I have setup a donation site via Plegie. Feel free to donate if you like this mod. I have put countless hours of time and effort into it along with many people who have helped me. I did not write this mod with the intent to make any money from it, I wrote it to help me with some needs that I saw in-game. You should have a macro named "ihml" that you can drag to the desired space on your action bar. You can find it among your normal macros or by typing /ihml pickup. If you logged in with all macro slots taken go to your macros and delete one from the general macros page (not the character specific). Then open the IHML configuration window (with /ihml) and click "Make Macro" on the options page. Done! Whenever a BigWigs boss module load/reset or you enter a zone you have a macro for IHML will automagically swap to the correct macro. Place the IHML macro on your cursor, ready to be placed on an action bar where you want it. Show a list of commands. Save any modifications to the current macro. Save modifications to a new macro. Notice the quotation marks. Use them if the name contains spaces. Change name for current macro. /ihml rename "macro" "new name"
Change name for another macro. Swap to the macro "anything else" if it exists. Notice the lack of quotation marks. 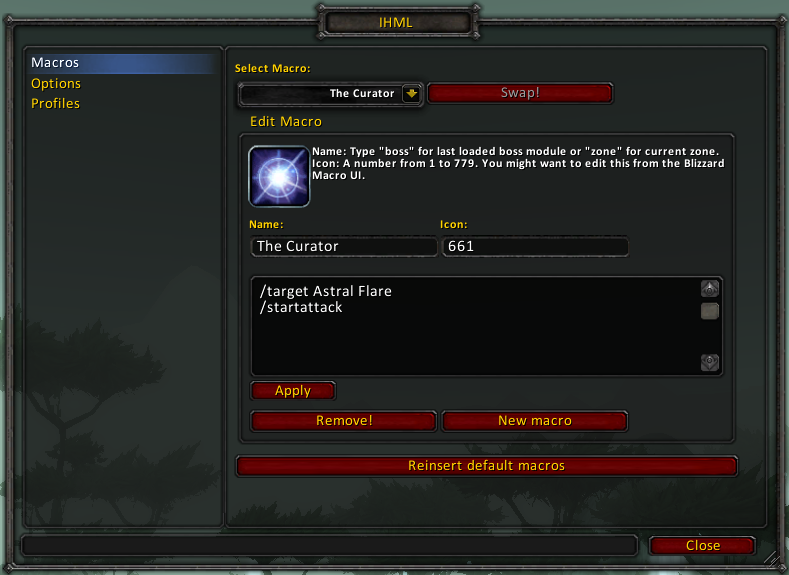 See the Default macros and Macro suggestions pages. There are some special macros you can make apart from boss and zone macros. default - This macro will be swapped in when no other macro takes priority. default1 - This macro will be swapped in when no other macro takes priority and you are in talent spec 1 (if the option is enabled). default2 - This macro will be swapped in when no other macro takes priority and you are in talent spec 2 (if the option is enabled). arena - Macro for arenas. (NYI) Note that macro names are case sensitive. "Default" or "PvP" will not work. If you have a common task that can be used in a macro for this mod, please make a ticket with the macro and other information. Please see the documentation on Localization to help with translation. Please use the WoW Ace tracker to file bug reports. Posting bugs in the comments is not the place to do it. Please use the WoW Ace tracker to add suggestions and feature requests. Please use the WoW Ace tracker to file bug reports. Bug posted for addon being busted for 4.3. Any of the developers considering fixing the error? IHML is an addon that gives you one macro which automagically changes what it is depending on what zone you're in or which BigWigs boss module is enabled. Any chance of adding support for the other 2 major boss mods? It still does not function with BW, DBM, or any other boss mod. Just updated some of the default macros on the page... feel free to take a look. Just converted the latest build to the localization application. Great addon, updates would be sweet! Do you plan on continuing to modify IHML once 3.0 is released?